A Studebaker Avanti R3 driven by Andy Granatelli at the Bonneville Speedway shattered 29 U.S. records in 12 hours in 1962: American class C Flying Start; 1 mile - 168.15 mph; 5 mile - 167.82 mph; 10 mile - 163.90. American class C Standing Start; 1 mile - 92.03 mph; 5 mile - 139.69 mph; 10 mile - 151.66 mph. All 29 records are the average speeds of a 2 way run, and are not the top speeds obtained. Granatelli returned with his R3 to score 170.78 mph, and broke five other Class C marks. Altogether twelve Studebakers smashed 337 different USAC records in six classes. Production R1 models listed 0-60 mph times of about 10.5 seconds, the standing-start quarter-mile in 17.0 seconds at about 80 mph, and top speeds of 115-120 mph. Rodger Ward won the Indy 500 in 1962; he was awarded an Avanti and labeled the official first Avanti Owner by Studebaker. Paxton powered 1963 Avanti in the Studebaker Museum. Muscle Car Of The Week Video: Is the Avanti a “Muscle Car?" Rodger Ward in 1962 at the Indianapolis Speedway with the Indy 500 Pace Car and the Studebaker Avanti prize. 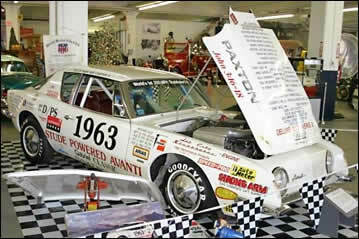 This was the Avanti awarded to Ward as a winner of the Indy 500 making him Studebaker's first official Avanti owner.